The Flip Video cameras first came on the scene in May of 2006, and while it took some time for the concept to catch on — they seemed to be everywhere in 2009 — the concept now seems to be really taking hold with bloggers. The idea that you can slip a small video camera in your pocket to take with you, and nearly instantly upload your content to sites such as YouTube as definitely an appealing one in this age of social media. It has gotten big enough that Cisco bought the company in May 2009, so is it really surprising that other big name companies are now taking notice of the idea? 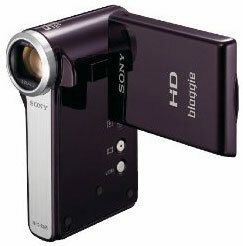 Sony recently launched a new line of full HD cameras by the unfortunate name of “Bloggie”. Apparently the marketing department wanted something that invoked their intended purpose, but it sounds like a symptom of a cold: “Oh, I’m fine, just feeling a little bloggie today …” The trademarked name aside, these camera promise a host of social aspects while also shooting video at a full 1080P. Both cameras use a built-in PMB portable software suite that allows you to hook them up via USB to your PC and Mac, and then upload your content directly from the camera to sites such as YouTube, Picasa, Facebook, Photobucket and so on. One of the most interesting features is that when you think “Sony”, you immediately think “Oh, it’s going to use Memory Stick cards for storage,” and while these do, they also allow you to use SDHC cards as well. Someone splash some water on my face, is Sony finally realizing that it can’t always be the sole provider of memory cards for its devices? While the general reviews for both models have been a bit mixed, for the price point they both seem to be decent options for the type of material you’re going to be shooting with them. However, with camera phones constantly improving, how much longer are we going to need dedicated devices for shooting casual video of our friends at a party?